Nikki is another fantastic dog that has been with us for WAY to long. In case you don’t remember her “back story” she belonged to an older woman who couldn’t take her into her nursing home so this girl has been loved and pampered her whole life. She’s a bigger dog who loves to go on walks but isn’t the kind of dog that would demand daily walks when the weather is bad. She’s usually more than happy with a 30 minute walk around the block and would probably not enjoy a long hike in the woods. Nikki is also crate trained and spends time in there without making a peep while her foster mom is away. Despite not minding her crate, her favourite place to be is the bed. The big bed. She’ll even hang out in the bedroom by herself just to be on the bed. Ironically, she won’t go up on the couch unless you invite her up but it doesn’t take much to convince her to come up for a snuggle. While Nikki is not a fan of strange dogs, she has bonded really closely with her foster brother and loves playing with him. 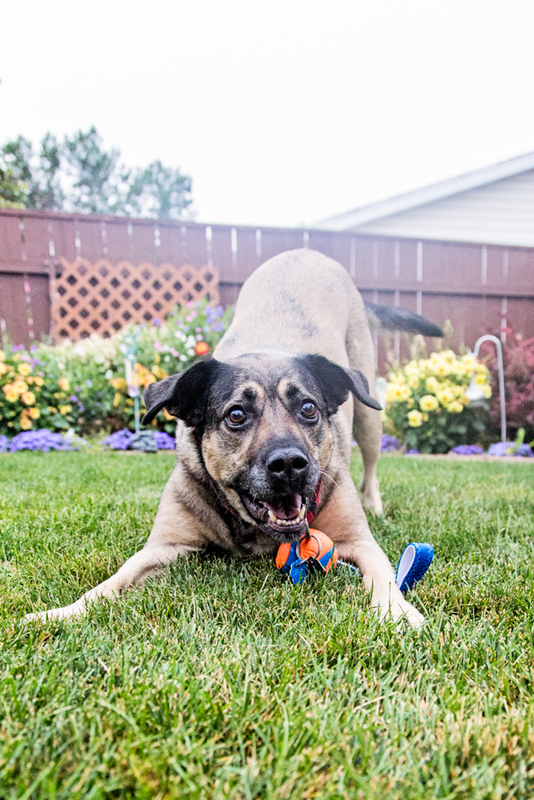 With the right introductions (and we could help with that) we think she would get along great with another household dog, but you probably wouldn’t be able to take her to the dog park or anything like that. The good news is, she is pretty good on a leash so leashed walks are quite enjoyable with her! She loves chasing and snuggling with her foster brother and they are often found curled up together. Nikki doesn’t play with a lot of toys but she does like to chew on bones and antlers and things. Her favourite treat is coconut oil of all things. As an added bonus it makes her coat nice and soft too! :) She loves to go for car rides and she just sits in the back and watches the world go by through the window. Nikki hasn’t had a single accident in the house, but she also doesn’t ask to go out… so you need to remember to let her out occasionally or you just might find her sitting there with her legs crossed! Nikki grew up in a pretty quiet household and we think that is what she would continue to do best in. She would be great with an older couple that is still active or a family with teenage kids. We have taken her out around large groups of children and while she didn’t do anything “wrong” we could tell that she wasn’t all that comfortable with all the noise and activity. Nikki is an amazing dog who is full of love. Come meet her. We bet your heart will melt.